A Photoshop tutorial for those who are just getting started, or just want to pick up some basic tips and tricks. Not all of us are Photoshop Pros! Figuring out how to de-mystify Photoshop is often an intimidating proposition. If you’d like to use Photoshop for a little more than just pushing around “stock” art, the tips and tricks in this Photoshop tutorial are for you! Use them in scrapbooking, promo making, and general layout design and liven up your layouts with some easily-learned tricks that will serve you well as you progress on your Photoshop journey. I spend about 14 hours each day in Photoshop, and after 20+ years, these are some of my most-used quick tricks and basic skills that make time spent working in Photoshop, or other photo programs, quick and painless with great results! 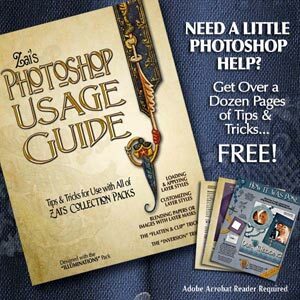 Let me just say right here that this whole set of Photoshop tutorials is available in full color PDF form for free so you can keep it handy as you work. Just click here to go to the freebies section of the store and download it for free. The instructions in this Photoshop tutorial are based on the Mac version of Photoshop CS, but should be able to be adapted to work in other versions and programs. It assumes you have at least a basic knowledge of Photoshop, but I do point out where exactly to find certain things in case you haven’t seen them before. It’s also more of a “how and why” type collection of tips, rather than a complete step-by-step Photoshop tutorial. If anything looks interesting, go Google your heart out and master it. There’s always 10 different ways to do things in Photoshop and this is just how I approach things. 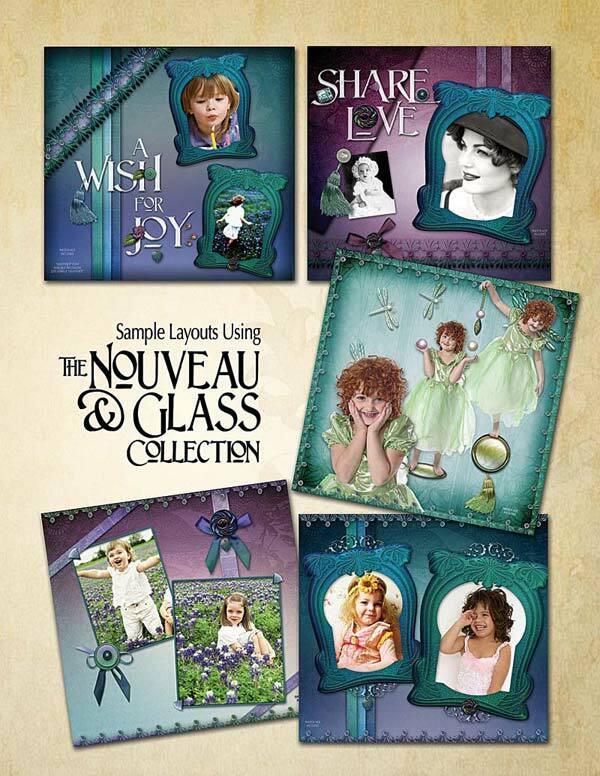 Included are some samples of layouts I’ve created with my own kits to give you an idea of what’s possible beyond just layering the kit pieces “As Is”. At the end you’ll find a link to my freebies which you can download and practice with if you feel so inclined. Have fun! Saving: The old rule applies: Save OFTEN and work on copies so you always have your originals. Memory: Lots of layers takes lots of memory, so make flattened copies of your finalized projects for use in other programs. Use these smaller files in layout programs like Quark, InDesign, or Word without the hassle of HUGE PSDs. Sending out for professional output? Save copies of your files as PDFs or high-resolution JPEGS, for easy uploading and transfer. See the end of the Custom Layer Styles section for a Photoshop tutorial on how to save high-resolution flattened TIFFS & JPEGS. Printing: For the best results when printing, use high-quality glossy brochure or photo paper. All my kit images are in RGB format. RGB should print better on a home inkjet printer. You can convert to CMYK for commercial printing, but you may need to adjust the saturation to brighten colors after conversion, as this tends to dull them slightly. Ready to move on to the next Photoshop tutorial?